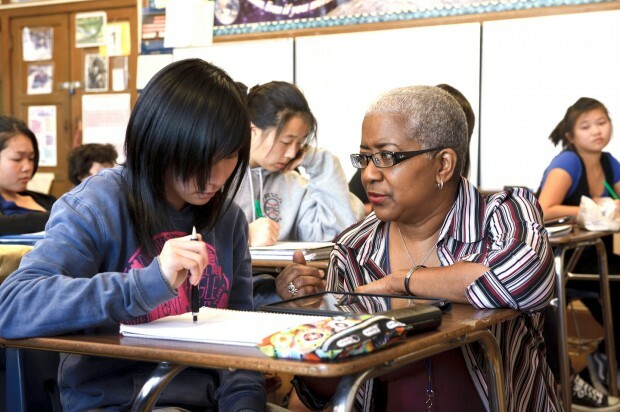 Halfway through a year-long pilot study using iPads instead of textbooks, a San Francisco eighth-grade algebra class is showing signs of every teacher’s dream: the spark of engagement in her students’ eyes. During my visit to her class last Friday, it was apparent that she was a big part of the reason they understood those problems. Mitchell walked up and down the aisles of the class for the entire duration of the period, asking questions, offering explanations, and giving one-on-one help when it was needed. The students never had a chance to tune her out – they were constantly being asked to participate one way or another, whether it was working out problems on the whiteboard (not interactive), watching instructional videos on the iPad, or working in groups. If the goal of learning is to figure out the “how” and not just the correct answer, then the gadget is doing its job. The class at Presidio Middle School is part of a study of a 1,000 California students, 400 of who are learning algebra with iPads. The pilot program for the iPad algebra application was developed by textbook publisher Houghton Mifflin Harcourt, and follows the traditional textbook page by page. But one of the differences between the book and the app is that students can watch videos of instructors explaining each problem as many times as they need in order to understand. If the goal of learning is to figure out the “how” and not just the correct answer, then the gadget is doing its job. “Students don’t really look at it as it’s solving the problem for them. They really want to understand. Kids really do want to learn, and this just makes it more fun for them to learn,” Mitchell says. Mitchell admits that when the pilot first launched, test scores for the class using the iPad were actually lower than those using the traditional textbook. Each class in the pilot program is figuring out its own way of getting the best out of the iPad, and in Mitchell’s case, the videos have been key. So have the grades improved? “Yes, there’s not a discrepancy between” the class using the iPad and their textbook using counterparts. Her hope, though, is that the iPad class scores will surpass the print book class scores. “One of the things about the iPad -- it’s a great tool, but it’s like anything, if you don’t use the tool you’re not going to get anything accomplished,” she says. “Sometimes I don’t understand the step by step the teacher gives me, but I watch the videos over and over again, and I can get it when I need the help. AND WHAT OF THE TEACHER? For those who fear that teachers will be left out of the equation, Mitchell firmly maintains that will not be the case. At least not at this point. See the slideshow of the class in session.